This was our first trip to Lech am Arlberg in Austria, and believe it or not, it wasn’t for skiing. We visited the Alps to enjoy the summer in Austria and discovered the best things to do in Lech am Arlberg when the temperatures are high. 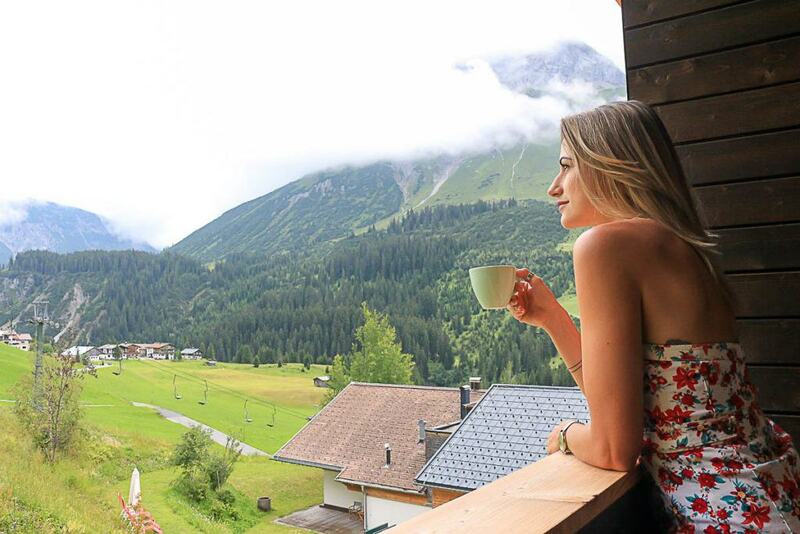 Although it wasn’t as hot as we expected, we discovered amazing things to do in Lech and in the villages around it, from outdoor adventures to wellness centers and delicious food. Lech am Arlberg was our second destination during our summer trip in Austria. First, we spent a couple of days in Bregenzerwald region, also in the province of Vorarlberg . If you like the outdoors and adventures you must read our super guide things to do in Bregenzerwald in the summer. Vorarlberg is the smallest province in Austria, despite its size it’s home to some of the best ski mountains in Austria and the villages are packed in the winter . But what many people don’t know is that Lech am Arlberg and Bregenzerwald are also amazing summer travel destinations. My suggestion is to stay at least four days in Lech am Arlberg, there are many activities to do there and you can also relax and enjoy the beautiful landscape. If you have more time, definitely stay longer. I wish we had an extra few days, because we had to cancel a few activities due to the rainy weather and we left Lech without doing everything we had planned to. 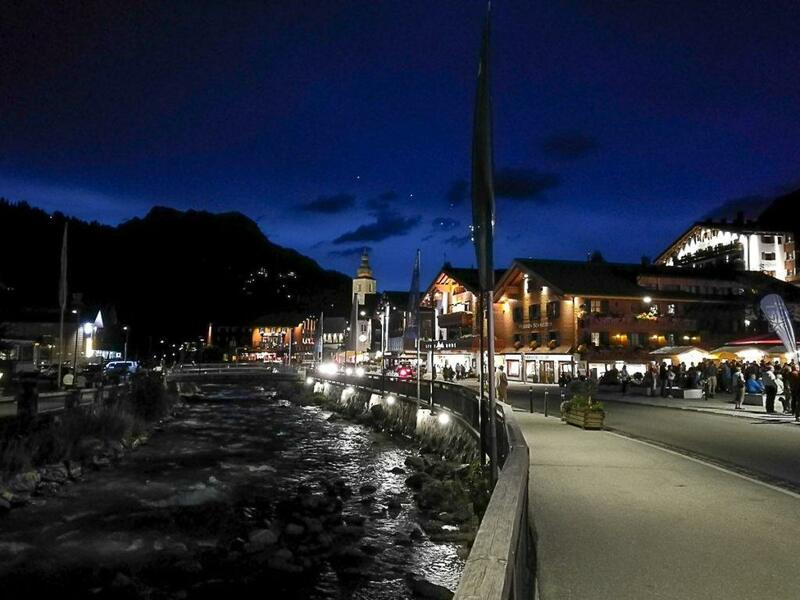 There are many guesthouses, resorts and hotels in Lech am Arlberg and you can also find good options for accommodation in Zug and Zürs, two cute villages close to Lech. We stayed in a lovely hotel in Zug and couldn’t ask for a better place. The Hotel Stäfeli was our home away from home, it’s a beautiful hotel with amazing leisure areas. From an open air terrace for breakfast to a reading room, gym and wellness center. We stayed at the new building and the room was to die for. Stunning views of the mountains and beautiful décor. They pay attention to every detail, from room service to the super cool Maxi Bar and the delicious breakfast. The hotel is managed by a lovely family that went beyond their way to help us plan our activities under the rain. Not to mention the Käsespätzle dinner we had there. As the hotel is a small property my advice is to book your room for summer in Lech as soon as you can. For winter holidays you need to make your reservation at least 2 months in advance. If you want to stay in Lech, here is the list of the best hotels in town. It doesn’t matter in which village you are staying, Lech, Zug and Zürs are well connected by bus and there are taxis running 24 hours among the cities. From boutique and small properties like Hotel Stäfeli to rustic lodging by the mountains, choose the hotel in Lech am Arlberg that suits your style of traveling and the experience you want to have. After skiing, I believe hiking is the second most popular sport in Lech am Arlberg and I can totally understand why. Nature is stunning and when the sun is shining the mountains look like marvelous paintings. 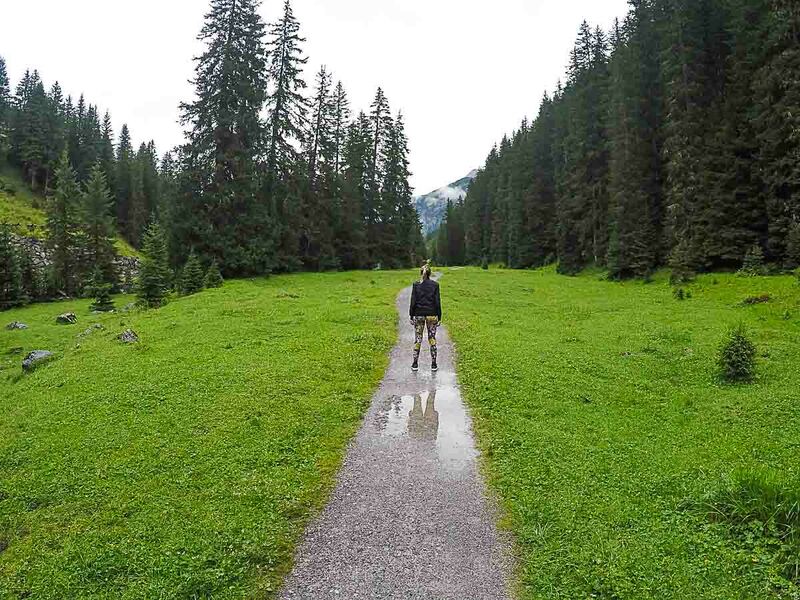 Lech’s summer guide listed 23 incredible hiking experiences from easy walks by the rivers and valleys to alpine hiking that even pro hikers will feel dizzy. All the hiking trails in Lech are marked and if you have the official map you can easily do it by yourself. Just be aware of the weather forecast and your fitness level, some hikes do require more experience and strength, so be careful when choosing your adventure in Lech. If you need, you can always hire a guide or go on a group tour. You can get all the information about the tours and hiking trail at the information office in Lech. 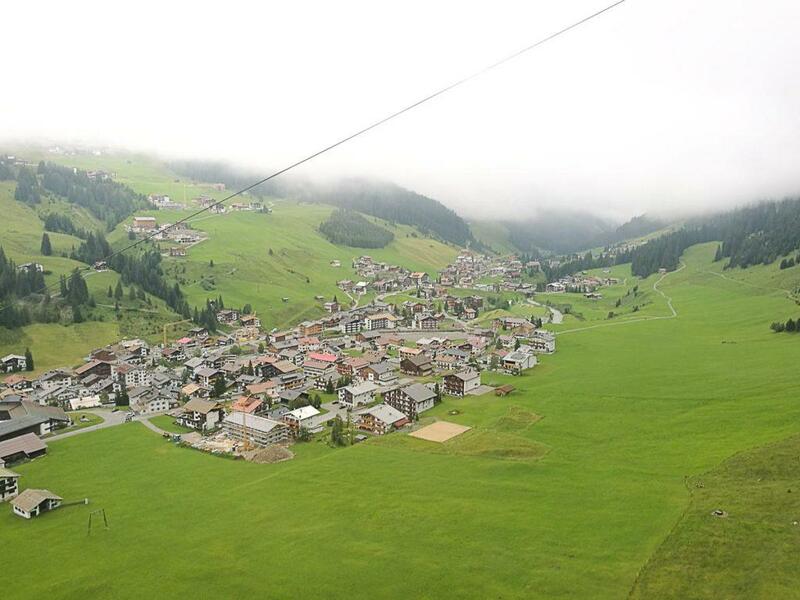 After sunny days and warm temperatures in Bregenzerwald, on the day we arrived in Lech it started raining. But it didn’t put us off, instead of hiking to the top of the mountains or to the lakes [because of safety reasons, as we are not super experienced hikers] we went on a nice walk from Zug to Lech along the riverbanks. The Green Ring Hike was what convinced us to travel to Austria in the summer and no doubt it’s one of the coolest things to do in Lech. 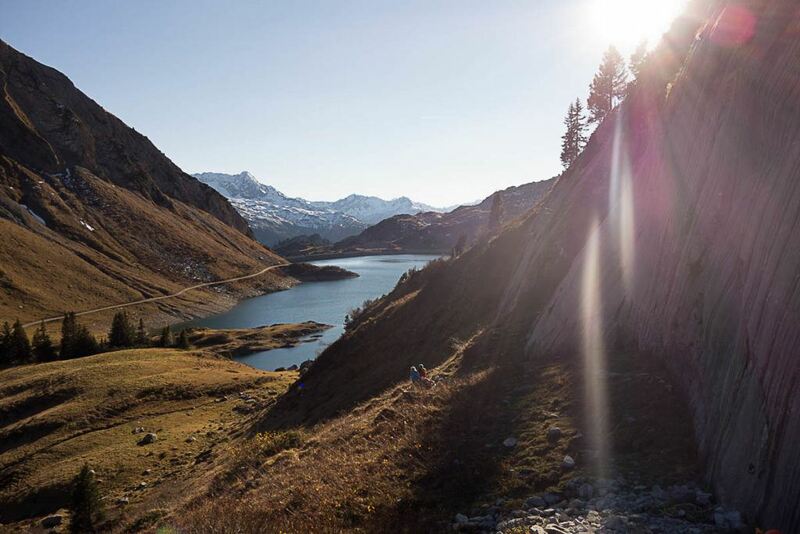 A three-day hiking route that takes you from Lech to Zürs and Zug, passing by geological sites, mystic forests, and wooden carved sculptures. It’s not only a physical challenge but also an immersion into this stunning part of Austria, its nature and culture. It’s possible to do the full three days hike or if you prefer you can do only one of them. 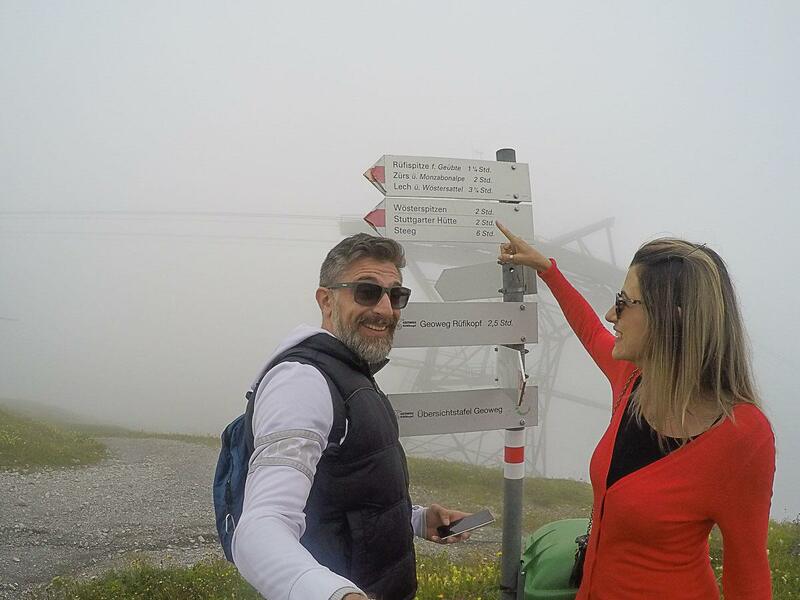 We planned to do the second leg of the Green Ring Hike, the one that starts from Zürs, goes all the way up, you sleep on the top of the mountain and after the sunrise you hike down to Zug. Yes, you read it right, we were going to sleep on the top of a mountain. 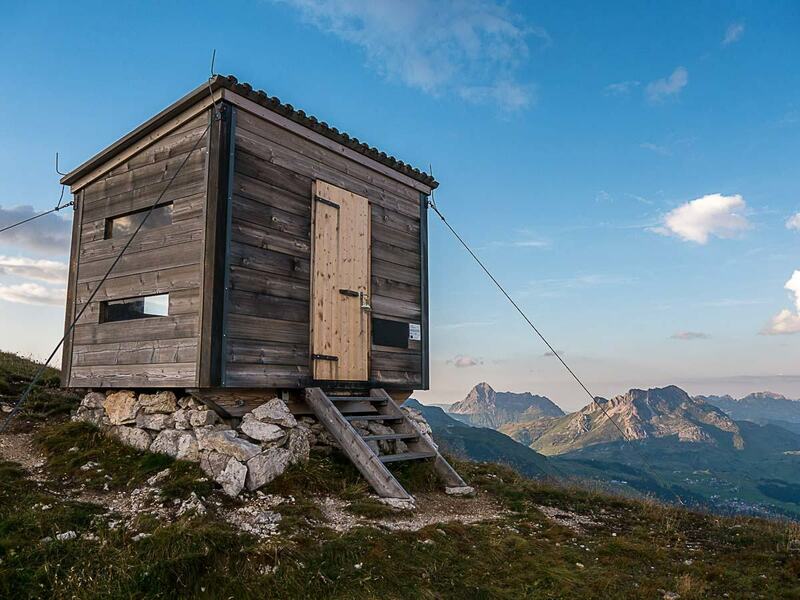 Our room for the night would be a wooden bivouac at about 2,300 meters above sea level. No electricity, no water, no heating, nothing but us and the stars. It sounded like an incredible adventure, the type of story you’d tell your friends, family and repeat it to your kids a million times. But the bad weather and the rain literally washed down our excitement. The weather forecast was really bad, it was calling for rain, strong winds, and even snow at the top of the mountain. For safety reasons, they didn’t allow two crazy Brazilians to hike there alone. This is a sneak peek of what we missed. Now we will need to travel to Lech again to finish our hiking business. You can bike around Lech, the surrounding villages and on the top of the mountains. There are many bike paths and trails that you can follow. One of the most scenic trails is the Spullersee Lake on the top of a mountain. The trail is a long one, 25 km with an altitude gain of 809 meters. But you don’t need to worry, you can rent an e-bike and have an extra help on the uphills. In Lech am Arlberg there many rental shops with bikes and hiking equipment. Or if you book a tour they have bikes and helmets for you. You can also rent bikes and electric-bikes in the hotels, so before heading to a rental shop ask at the reception of your hotel, they might have the bikes and also the tours. 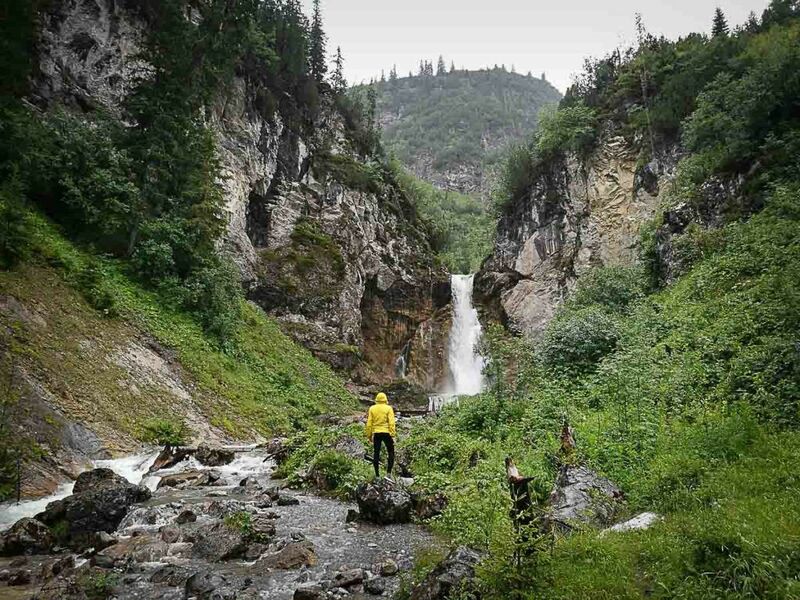 We stayed in Zug, only a few minutes from the center of Lech, and despite the rain, we decided to go for a quick hike to find the Zug waterfall. The girls from our hotel gave us the directions, the rain coats and we set. It was pouring but the forest never looked greener and more lively. We had the path only for ourselves, passing by a golf course, crossing the Lech River and hiking towards the mountains. A few minutes walking and there was the beautiful waterfall! When in Lech you must go ride the city’s cable car and appreciate the stunning views from the top of Rüfikopf panorama mountain. From there you can start many hiking and biking trails or just enjoy the view while sipping a glass of wine. From the top you can see Lech and surroundings. When we were down at the foot of the mountain the sun was timidly shining and the weather was looking promising. A few minutes up and we couldn’t see a thing… a thick fog covered the area. Anyway, it was a nice ride! You gonna feel tired after all the hiking and cycling but don’t worry, the cure for your sore muscles is in one of the wellness center in Lech or even at your hotel. Swimming pool, sauna, massage… life is so much better when you take the time to pamper yourself and relax. Lech is perfect for this! 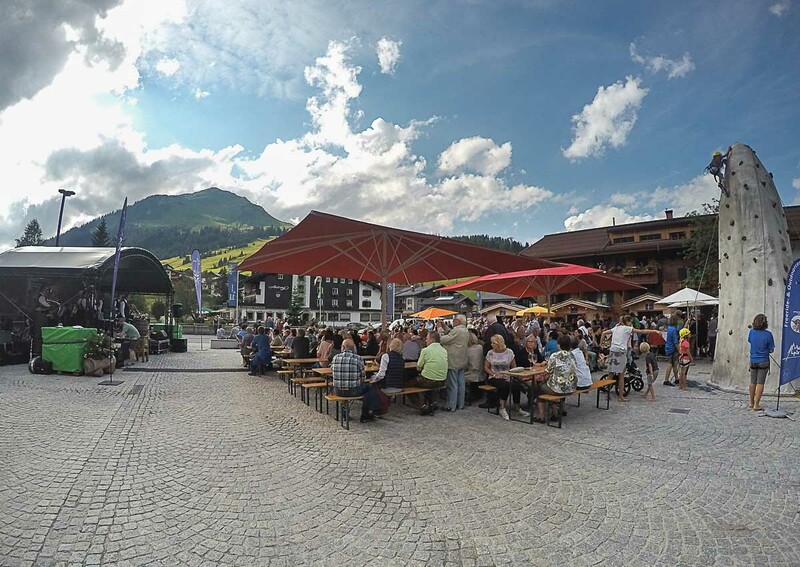 In the summer there are many events and activities happening in Lech am Arlberg. We were lucky enough to be there during Dorffest [22 of July] enjoying concerts, local food and beer. It is a town celebration with people dressed in traditional costumes, kids playing around, a lot of music and dancing. 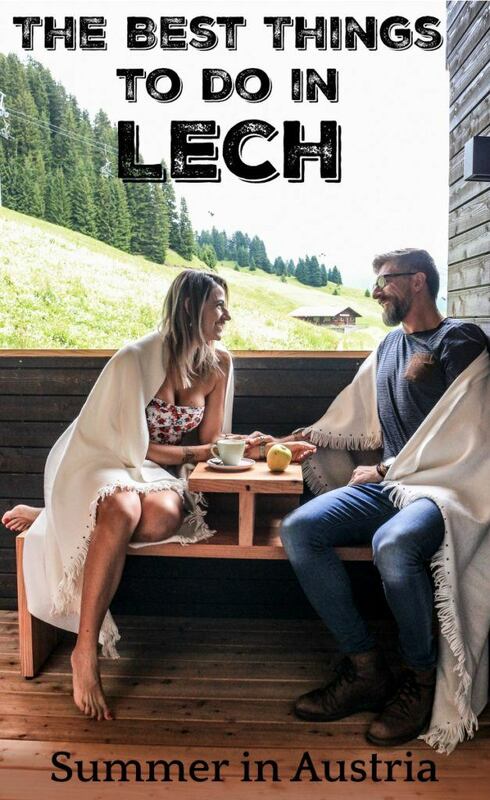 If you are looking for things to do in Lech in the summer time check out Lech official website, and try to plan your visit to Lech during the festivals. 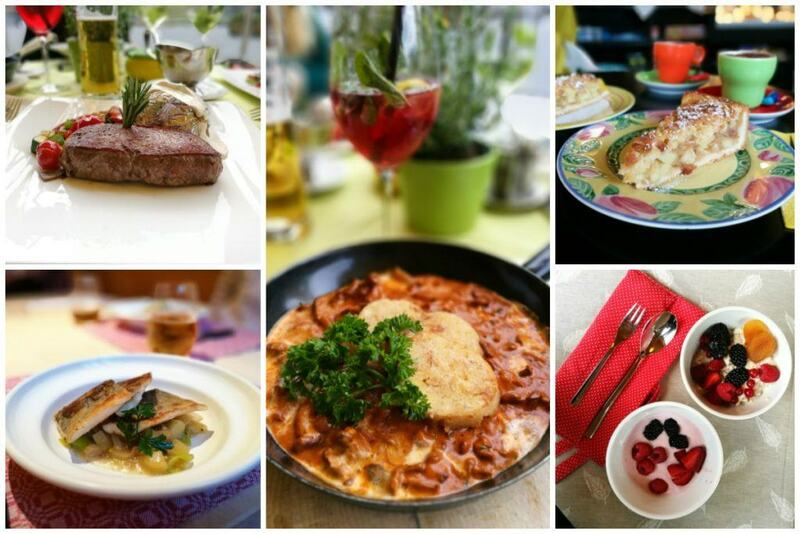 Eating is no doubt one of the top things to do in Lech in the summer and also in the winter time. The local food is delicious and it doesn’t matter if you go to a fancy restaurant or to a small guesthouse, the food will be good! The Tannbergerhof restaurant can’t be missed out. The hotel is located in the heart of Lech, just beside the tourist information office. If the weather is good, sit outside and order a glass of Hugo. Rob was craving for some good meat so he ordered a steak with potatoes and salad and I wanted to try the mountain food and the waiter recommended the “Ragmpfifferlinge mit Semmelknodel” a creamy mushroom dish with dumplings. It was freaking delicious, creamy and well seasoned, thehe perfect meal to fill up your stomach and soul. Read more about Tannbergerhof Restaurant here. This small restaurant hiding behind the church in Zug is a place to experience. They have just a few options of starters, main courses and desserts, but all the dishes are cooked to perfection. We had a mushroom soup to start then I ordered trout with potatoes, leek and mustard seeds [gorgeous] and Rob tried the chanterelles mushrooms in a creamy sauce with bread dumplings [fantastic]. If you like something more exquisite you can order the game of the day and try something very unique from the region. Starters and main courses were delicious, but the dessert was the star of the night. I have a thing for pancakes, seriously I LOVE them. When I read that they served fresh pancakes with wild strawberry sauce I didn’t think twice. The problem is that the pancakes were huge, the size of another meal. So by far it was the best dessert I have eaten in Austria. Rote Wand Schualhus is a small restaurant and you need to book a table in advance. Read more about Rote Wand Schualhus restaurant here. The Allerlei Shop is the perfect place for a quick bite, sandwiches, and delicious coffee. We were addicted to the homemade apple cake and the cafe became our favorite spot for a snack between hikes. It’s located near the hotel we stayed at, handy and delicious. The Käsespätzle served in the Hotel Stäfeli is one more reason why you should book a room there. Every Monday the Stäfeli family cooks a traditional käsespätzle for the guests. It’s a type of pasta prepared with layers of mountain cheese, then baked and served with crispy golden onions on top – I’m drooling right now. The guests get together around the fireplace and the wood-fired oven where the patriarch of the family prepares the traditional dish. Wine and delicious home cooked food, it was our last dinner in Lech and we couldn’t have had a better experience. Not only the food was delicious but the atmosphere was great. That day we were a bit sad because we didn’t make it to the Green Ring Hike. That was the night we were supposed to sleep on the mountain bivouac, but in the end the lovely dinner made up for our frustration. We had the opportunity to experience an unique moment and tried such a delicious meal. You can take a bus to Lech from any other town or village in Vorarlberg. That’s how we did it, we took a bus from Au [using our Bregenzerwald Guest Card – so no extra fee for this intercity ride] to Lech, and in Lech we took another bus to Zug where we stayed. It is super easy and most of the buses schedules are organized in a way that you don’t need to wait for the connections. If you are traveling to Lech from another country, the best option is to fly to one of the big cities around [Innsbruck in Austria, Munich in Germany or Zürich in Switzerland] and from there taking a train or a bus to Lech. You can search and book the best flights at Skyscanner and Kiwi.com. Traveling by train is another good option. There are daily trains from Innsbruck and Vienna to Langen am Arlberg, the closest train station to Lech. If you are planning to travel by train in Central Europe or in Austria check out the Eurail Pass deals. We used the Eurail Pass twice and for us there is no better way to travel in Europe by train. One pass for 28 countries and up to three months of travels. The weather in the Alps changes a lot. Prepare yourself for lovely warm days and also some snowfall. In Lech the average temperature in summer is 20ºC, but when we were there the thermometer hit 8ºC. So you must pack wisely to survive such an unpredictable weather. For warm days hat, sunglasses, sunblock, and light clothes are a must. And don’t forget to pack a pair of hiking boots [here are some good hiking boots to buy], a rain jacket [check out these models] and a small backpack is also important for hiking and cycling tours. The maps or even some specific equipment for outdoor adventures you can get at the shops in Lech am Arlberg. Now it’s time to book your tickets and start planning your itinerary of cool things to do in Lech am Albert. Summer in Austria is great fun with gorgeous nature and tons of outdoor activities. Enjoy Lech and if you have some spare days visit Bregenzerwald, an hour bus ride connects the two towns and you can have a real taste of adventure in Vorarlberg’s summer. Love this post? Pin it for later and share the love! I’d be hiking quite a bit in this area. I dig a good hike even if a place lacks character, or has not natural beauty. Lech has both, in spades. Super Sound of Music feeling to it which brings back pleasant child hood memories, as I watched the flick quite a few times as a wee lad. Lech is certainly a great destination. Hope to visit during the skiing season! Can we do paragliding in lech? How to Plan the Cheapest Tibet Tour?